Alexandre Dumas, pére (French for “father”, akin to Senior in English), born Dumas Davy de la Pailleterie (July 24, 1802 - December 5, 1870) was a French writer, best known for his numerous historical novels of high adventure which have made him one of the most widely read French authors in the world. Many of his novels, including The Count of Monte Cristo, The Three Musketeers, and The Man in the Iron Mask were serialized, and he also wrote plays and magazine articles and was a prolific correspondent. The Count of Monte Cristo is an adventure story that takes place during the historical events of 1815 to 1838. This piece tells the tale of a man who seeks revenge after his escape from prision and deals with the central themes of vengeance, justice, forgiveness, and mercy. FCIT. "Alexandre Dumas, pére author page." Lit2Go ETC. Web. 19 April 2019. 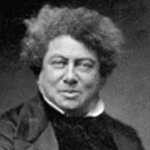 <https://etc.usf.edu/lit2go/authors/169/alexandre-dumas-pere/>. FCIT, "Alexandre Dumas, pére author page." Accessed April 19, 2019. https://etc.usf.edu/lit2go/authors/169/alexandre-dumas-pere/.